Simpactful is pleased to announce that we are expanding our retail and CPG capabilities with a dedicated team of experienced leaders in Northwest Arkansas with over 200 years of combined Walmart and Sam’s Club experience. Our recent expansion of the team has accelerated our capabilities to meet clients’ needs with the world’s largest retailer. “We now have the right people in place that have worked for or with Walmart/SAMS for many years,” says Mike Russell, Simpactful Senior partner. This experienced team will provide a strong commercial presence in Northwest Arkansas to show our commitment and expertise to the supplier community. We are looking forward to the opportunity to increase sales and reduce cost for our clients. With this team, Simpactful will focus on bringing brands closer to the Walmart and Sam’s organization and decision-making process, by sharing shopper/consumer insights, providing strategic direction for growth, and evolving to meet changing needs to win. 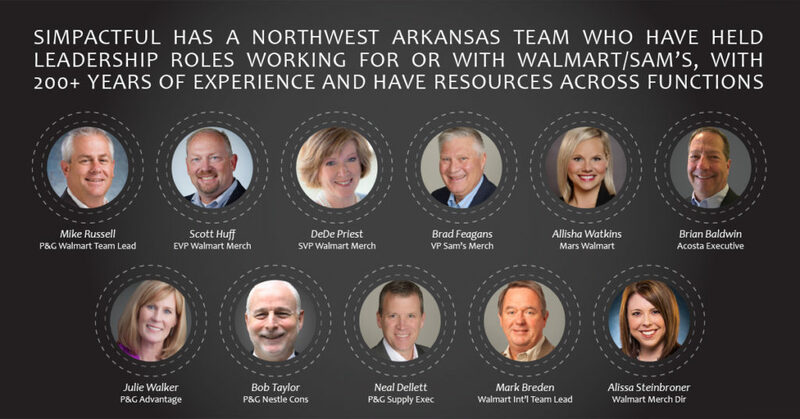 With rising challenges for CPG companies over the past decade and the foreseeable future, the Northwest Arkansas Simpactful team will make the biggest impact on navigating the ever-changing omnichannel landscape with Walmart not just through strategy, but execution as well. “With our experienced team, we know how to execute,” adds Russell, “as the retailer-supplier relationship has evolved, there has been an increased expectation on the supplier - it’s not enough to just focus on the theory. We have the expertise and passion to work with clients to become a better negotiator and collaborator with Walmart.” Both skills that are needed to be successful at Walmart. So where can CPG companies begin with Simpactful? The best place to start is with your current business needs - from JBP support to establishing strategic business priorities. The Simpactful team can assess your capabilities against what we know to be the key requirements of Walmart/Sam’s to enter in to a joint value relationship. The Simpactful Northwest Arkansas team experience spans a variety of functions and experiences – general management, merchandising, sales, marketing, consumer research, product supply and all retail channels including eCommerce, food, drug, mass, and club. Our leaders are proven, having led their companies through today’s challenges with strong demonstrated results. We are passionate about sharing our insights and success models with our clients. Reach out to the Simpactful team at email: contact@simpactful.com or 952-234-6394 and let us share how we can address your biggest challenges at Walmart and Sam’s Club.